Before 1954, the Pledge affirmed that we were “one nation indivisible, with liberty and justice for all.” Indivisible means we can rise above our differences, religious or otherwise. Liberty means the right to act and speak freely no matter what one’s faith or philosophy may be. And Justice, of course, means equal rights for all, regardless of whether or not we believe in a deity. The Knights of Columbus – a Catholic men’s group – led the lobbying effort to add “under God.” Now the Pledge is twisted, with divisive religious language that implies true patriots must be believers. 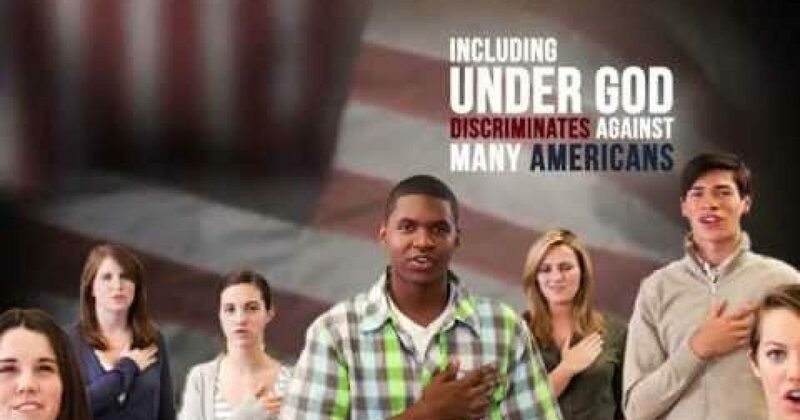 With “under God” added, the Pledge is not a statement of patriotism. Instead, extremist preachers and politicians point to the language to validate their view that those who don’t believe in God don’t belong. (…) commissioned by the American Humanist Association with support from the Stiefel Freethought Foundation, reports that 34 percent of Americans support removing the phrase “under God” from the Pledge of Allegiance. The study, conducted in May of 2014, responded to a 2013 poll by Lifeway Research, which stated that only 8 percent of American adults felt that “under God” should be removed from the Pledge. Unlike the Lifeway Research poll, the survey done by The Seidewitz Group included a brief description of the history of the Pledge of Allegiance, including the information that “under God” was only added as recently as 1954 in response to the Cold War and that some Americans feel that the Pledge should focus on unity rather than religion. If the AHA wins this campaign, is removing “endowed by our creator” from the Declaration of Independence next?